Grammy nominated, London based Mixing and Sound Engineer Jonas Westling has worked with artists like Lady Gaga and Paul McCartney. Even with his success, his DAW was missing something. Westling has found everything he was looking for and more with Studio One 3.2. Here he chats about some of his favorite features including the Smart Tool, the Trim Automation Tool, the Console Shaper and overall quality Studio One offers. 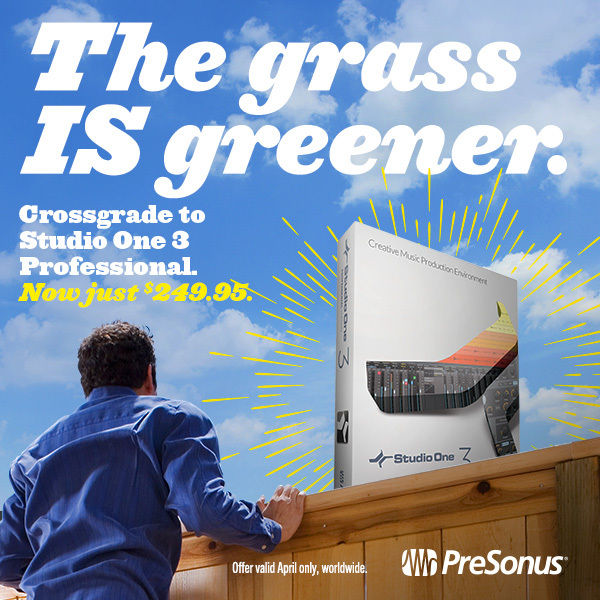 If you’re ready for a change like Jonas was crossgrade to Studio One 3 Professional before April 30 and save $50! Learn more about the promo HERE! For more on Jonas Westling, click here. 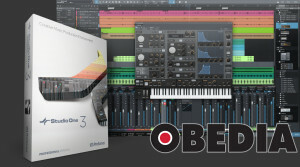 We’ve been hearing a lot of nice things from folks who have made the switch from their old DAW to Studio One 3. I could talk more about that, but I’ll let this YouTube video do the talking instead. Interested? If you’ve been holding off on crossing over to the most quickly-growing DAW on the planet, there’s never been a better time than now! If you own a DAW from the qualifying list below, you’re entitled to the discount. 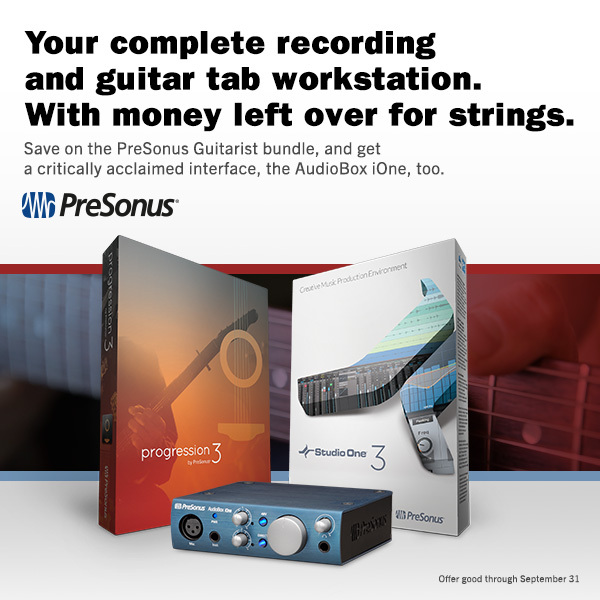 All you need to do is provide a copy of the UPC code or original purchase receipt for the “other DAW” in an email to crossgrade@presonus.com. Upon approval, you will be issued a coupon code, which you can then use to purchase Studio One Professional for the limited-time Crossgrade price of $249 USD—down $50 from the typical $299 price. Kindly allow up to 24 hours for the coupon code to be issued Monday through Friday. If requested on a weekend, the request will be handled the following Monday. Of course, I can’t forget this bonus: for those of you considering making the switch from Pro Tools, here’s a set of ELEVEN videos from Russ Hughes at Studio One Expert covering the best ways to make the transition from Pro Tools to Studio One. Quick note to Studio One users: The kind folks over at OBEDIA are offering 75% off of Studio One cross-training! This subscription service lets you learn directly from the OBEDIA crew via phone and/or a remote desktop connection. Click here for more details on this promo and request your discount code! 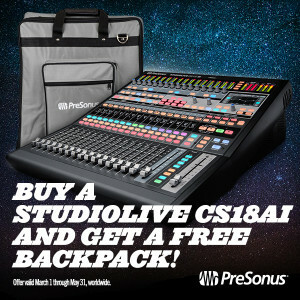 Buy a StudioLive CS18AI before May 31, 2016 and Get a Free Backpack! A new month means new deals and new freebies from PreSonus, including a FREE backpack when you purchase the StudioLive CS18AI before May 31, 2016! Equipped with 100 mm, touch-sensitive, motorized faders and AVB networking, the StudioLive CS18AI control surface provides a compact, intuitive mixing solution for PreSonus StudioLive RM16AI and RM32AI rack-mount digital mixers and Studio One 3. Doubly cool is that we have a significant rebate offer going on for the Studiolive RMs, and you can combine both offers to get a mix system of up to 64 channels, all controllable from the CS18AI. Click here for more details on the RM mixer offer! The black and grey, backpack-style gig bag will keep your also black and grey CS18AI safe and sound on the road, and is stylistically compatible with both casual and formal attire. Portable and comfortable, this bag provides tons of internal storage and two external pockets. All you need to do is fill out and submit a simple rebate form with proof of purchase of your CS18AI. Not sure if the CS18AI is right for you? Here’s a video overview to persuade you. This deal is available worldwide until May 31, 2016. Comments Off on Buy a StudioLive CS18AI before May 31, 2016 and Get a Free Backpack! Good news for the home studio and live sound crowd—until May 31, 2016, we’re offering up to 17% (That’s $200 in the USA) off of our RM-series mixers. 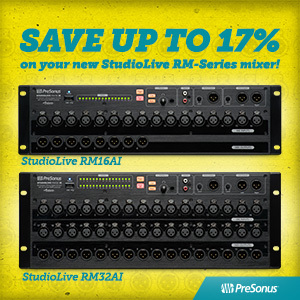 The RM-series mixers recently had cascading support added in the most recent firmware update, allowing you to get ​up to ​a 64-channel mixing powerhouse ​​for not a lot of cash.​ Not to mention, the same firmware update also came with significant advances when using the StudioLive RM as an audio interface with Studio One 3.2, including remote preamp control and hybrid fat channel DSP for low latency recording with FX. And yes through cascading you can have up to 64 channels of I/O in your studio now. What is cascading you ask? Cascading provides the ability to link two RM mixers together to create one integrated mix system, in this case via Ethernet. Which begs the next question: is this offer is good for​ only “one per customer.” ​No, you can take advantage of this offer on as many RM mixers as you’d like. Worth noting is that this is a great opportunity to do the promo combo mambo. We’re also currently running a deal on the StudioLive CS18AI​, the touch sensitive control surface for the StudioLive RM​ that includes a free backpack. So, if you’re looking to get a full-on 64-channel mix system​ (or even just a 16)​ while saving a significant amount of money, and get a useful, practical freebie while you’re at it—now’s your chance! It’s true–we like you. A lot. 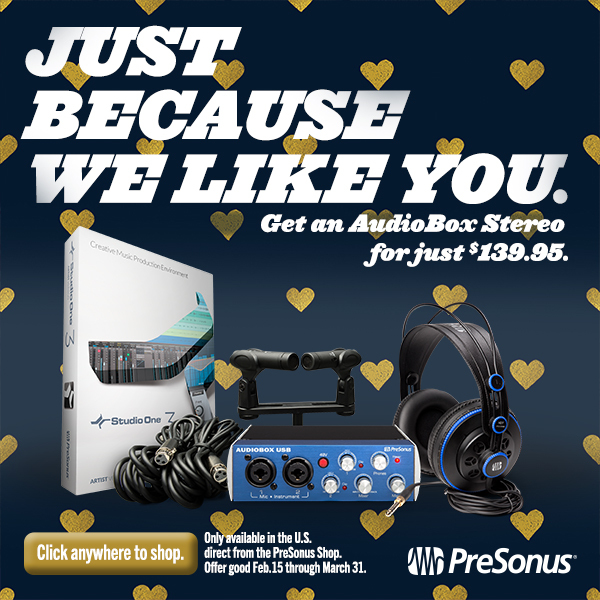 So much so we’re offering the PreSonus AudioBox Stereo recording kit for just $139.95! Whatever you’re recording–rehearsals sessions, live performances, podcasts, worship gatherings– the AudioBox Stereo kit has everything you need. It’s simple, reliable and portable. And it won’t miss a beat or slow you down! This is a no-fuss, no-muss, temporary price drop for customers in the US of A all because we like you. 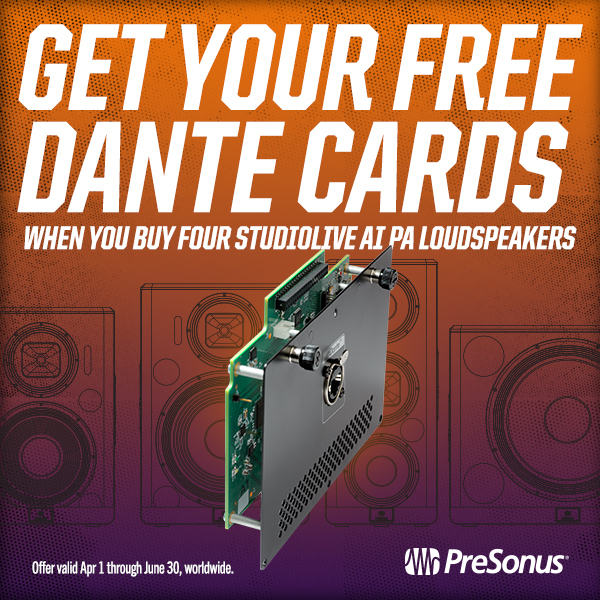 Don’t wait to add this to your PreSonus collection. Offer ends March 31, 2016. Available only from our online store, click here to shop. I’ll keep this short: everybody wins! 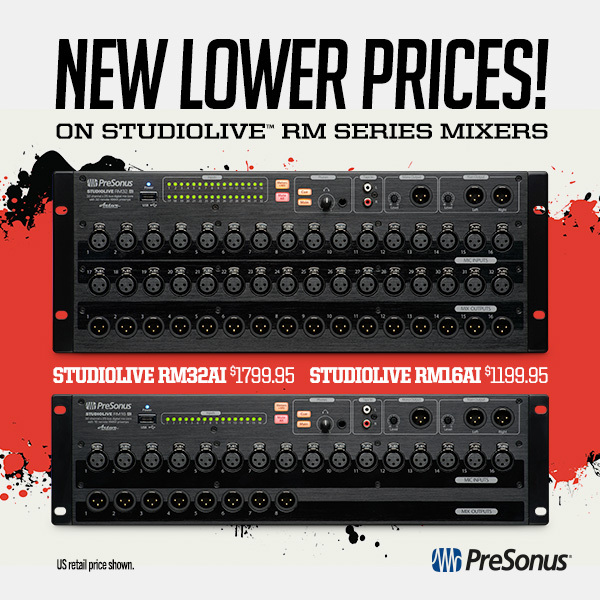 From this day forward, the pricing of StudioLive RM-series Rack Mixers have dropped. Prices are lower worldwide and vary by region, but here in the US they have been reduced by $200 USD, each. That brings the StudioLive RM32AI down to $1,799.95, and the RM16AI down to $1199.95. You may or may not decide that it’s a coincidence that this price drop coincides with the availability of the StudioLive CS18AI touch sensitive control surface for RM mixers. It makes the idea of a complete AVB mix system, with motorized faders, no need for a digital snake (because it’s replaced by a single ethernet cable) and no need for a separate stage box more appealing, now doesn’t it? If you’re still not sure about getting an RM mixer, read more about them by clicking here. And if you don’t want to take our word for it, you can read an excellent review from FOH Online here. This is not a rebate or limited time offer. This is a permanent price drop. Find a US dealer and save on a StudioLive RM digital mixer.